I Love Baking button badges. Perfect for all of you domestic goddesses (and gods) and fans of the great British bake off. 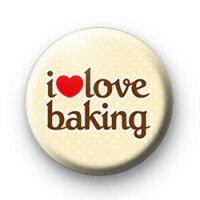 If you love cakes & baking this is the badge for you. Cute light cream coloured badge with polka dots and the text I love baking. Also has a big red love heart. Standard 25mm badge made from metal with a plastic coated design.